Deluxe Foaming Bath Salts with a light musk scent. 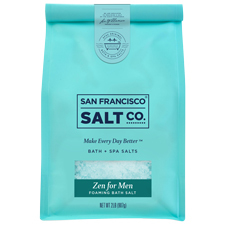 Forget the shower, make time for a bath and treat yourself to some must deserved relaxation at the end of a long day by adding a handful or two of our Zen For Men Bath Salts to a tub of warm running water to relax your mind and body. 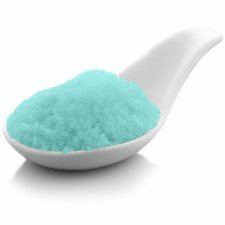 Foaming Pacific Sea Salts in a fine/medium grain blend with a light musk scent. Blue in color. Benefits: A relaxing foaming bath salt. Size: Various Options (see right) - Ships in a bulk resealable bag. Grain Size: Fine/Medium grain blend. Color: Blue (actual color may differ from color shown on your screen). Scent: Zen For Men Fragrance - A light musk scent. Ingredients: Pacific Sea Salt, Sodium Lauryl Sulfoacetate (Lathanol) Powder, Fragrance, Glycerin (Vegetable Glycerin), Tocopherol (Vitamin E), Aloe Barbadensis (Aloe Vera) Leaf Juice, FD&C Blue 1 Lake.